Hello Dealsnloot Readers,Ruuh Fb A Fictional Character Is Offering Refer & Earn , In This Refer & Earn You Can Earn Unlimited Freecharge Coupons Just By Referring Your Friends To FB Messenger App.This Offer Is Not Given By FB , It’s A Fictional Character ,You Can Earn Upto ₹ 1000 Freecharge Coupon Just By Referring Friends. So Hurry Grab This Free Gift Card and Vouchers Loot. 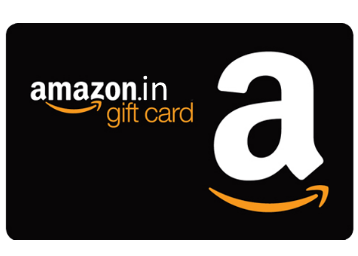 How to get Rs.50 Amazon Voucher ? 3. Now Open In FB Messenger Join Ruuh & Send Him Hi Sms. 5. Now You Will Get Referal Link From Them. 6. Copy Referal Link & Start Sharing With Friends. 7. When Friend Download Start Chatting With “Ruuh” , It Will Be Count As Valid Refer. 3. 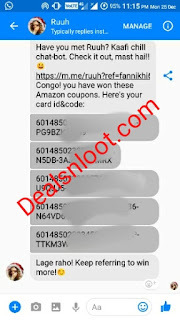 You Will Get Amazon Coupon Instantly Via Sms. 4. You Can Refer 4 Friends & Get ₹ 50 & More In Multiples Of 4. 5. Offer Valid Till Voucher Is In Stock. 1. Delete Messenger & Again Click On Your Referral Link. 5. Repeat Steps Again With New FB Id.